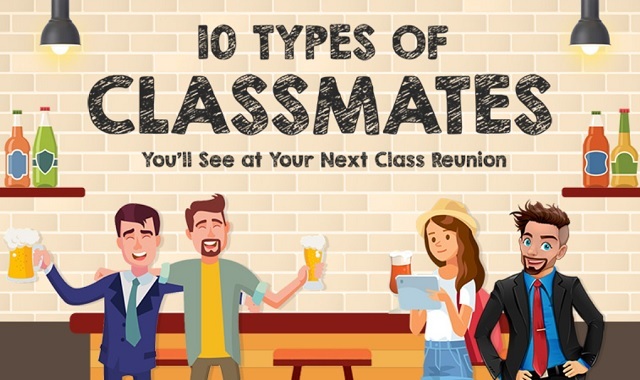 10 Types of Classmates You'll See at Your Next Class Reunion #infographic ~ Visualistan '+g+"
A look at the typical profiles of former classmates you may run into at your next high school class reunion. As part of our ClassFinders survey of 10,000+ members who had milestone class reunions last year, we asked alumni why they wanted to go (or didn't want to go) to their class reunion events. The responses were enlightening (seeing the change in people was the main reason people wanted to go) and helped us create this handy guide to the 10 types of people you'll see at your next class reunion.